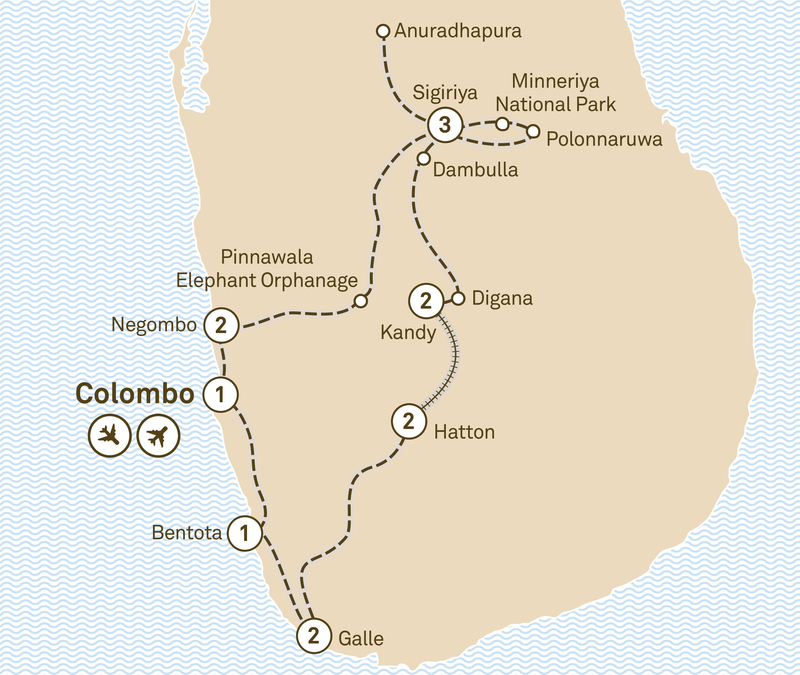 From Negombo to Colombo, uncover the spells of Sri Lanka with it's beautiful beaches, green carpets of tea plantations, ancient and colonial history. Beautiful beaches, green carpets of tea plantations, the heady flavours of Sri Lankan dishes, the friendly people and the blend of ancient and colonial history on this small island nation will leave you spellbound. Your boutique journey begins in the seaside town of Negombo, before venturing into the Cultural Triangle, in the heart of Sri Lanka. Visit the World Heritage-listed gems of the sacred cities of Anuradhapura and Polonnaruwa, the Sigiriya ancient rock fortress and Dambulla cave temple, plus enjoy wildlife safaris, all during your three night stay in Sigiriya. After a special two night stay in Kandy, immerse yourself into the tea growing region around Hatton, including a scenic train ride through the rolling hills. Continue heading south to the World Heritage-listed city of Galle, staying in the heart of the 400-year-old fort. Enjoy relaxing strolls along the beach in Bentota before ending your journey with a Special Stay in Colombo. Welcome to Sri Lanka where your journey into wonder starts with a two night stay, an old colonial manor house. Drive to Muthurajawela Wetlands Sanctuary at the southern end of the Negombo Lagoon to view the varied birdlife and highly diverse ecosystem by boat. Return to the historical beach town of Negombo, with its many Dutch and Portuguese churches, stopping at the local fish markets and villages to see the popular outrigger canoes known as Oruwa. On an in-depth walking tour exclusively designed by local expert Mark Forbes, visit the remains of this quaint seaside town’s ‘fort’ which saw much action between the Dutch and Portuguese in the 17th century, before being turned into a prison by the British in the late 1800s. Your welcome dinner tonight will be on the beaches of Negombo with the crashing waves and sunset as a dramatic backdrop. En route to the Cultural Triangle, visit the elephant orphanage at Pinnawalla, established in 1975, and learn about their captive elephant breeding program. Later, arrive at your award winning accommodation, your base for the next three nights. Relax on the balcony of your villa overlooking the rice fields, and the famous Sigiriya rock fortress. Take the opportunity to climb the famous ‘Lion’s Rock’, the ancient rock fortress and city of Sigiriya, built in the 5th century BC. Alternatively, choose the less strenuous option of witnessing the native slender loris in their natural tree habitat. Travel to the World Heritage-listed sacred city of Anuradhapura, widely acknowledged as the first capital of Sri Lanka. This religious and political capital flourished for 1,300 years before being lost to the jungle. Relax with a drink in hand, admiring the views of Sigiriya rock fortress in the distance. Complete the Cultural Triangle by visiting the World Heritage-listed historical city of Polonnaruwa, regarded as Sri Lanka’s second ancient capital after the destruction of Anuradhapura. Residing on a man-made lake, the remaining city walls, temples and dagobas give evidence of this city’s once opulent past. After lunch with a waterfront view of the ancient Minneriya Tank, explore Minneriya National Park on a jeep safari in the hope of witnessing a leopard amongst the elephant, deer and other wildlife found in the reserve. On your drive south to Kandy stop at the World Heritage-listed Golden Temple of Dambulla. A sacred pilgrimage site for 22 centuries, this cave monastery and its five temples flanking the golden temple of Dambulla house some of the best preserved Buddhist murals and statues of their type in Sri Lanka. Arrive in the World Heritage-listed sacred city of Kandy, the last capital of the Sinhala kings before British occupation in 1815. Check into your luxury boutique hotel, surrounded by natural beauty only minutes from the city, and your home for two nights. The day will end with a special cultural show, performed by Kandyan dancers and dinner to follow at your hotel. Explore this cultural city by Tuk Tuk visiting the illustrious Temple of the Sacred Tooth Relic and the picturesque Peradeniya Botanical Gardens. Enjoy a special visit to Tamarind Gardens in Digana, a village near Kandy. Here you will be served a traditional Sri Lankan style meal at a community-supported farm. Learn all about the project, which aims to develop a sense of community in the displaced villages in the area. Return to the Kandy markets for some shopping where the remainder of the afternoon is at your leisure. The production of tea is synonymous with Sri Lanka. Take a train for a scenic journey through the hills that are home to Sri Lanka’s tea estates to Hatton, located in the Nuwara Eliya District. Continue to your Special Stay property, a collection of charming planters’ bungalows, for two nights in the high country. This afternoon, enjoy high tea whilst overlooking the green blankets of the tea plantations and the Castlereigh Reservoir. Settle back into your secluded bungalows with an evening drink before dinner. Accompanied by the resident tea planter, visit the tea factory to learn all about the process of growing and producing the famous ‘Ceylon Tea’. End the tour with a tasting of different grades of this great brew. Or, enjoy a guided kayak excursion along the lake through the tea covered hills. The remainder of your day is yours to relax. Perhaps take a gentle walk along marked trails around the estate or have a game of croquet or tennis before your afternoon high tea. Savour your evening drinks before your dinner to reflect on the day’s activities. Head south to the colonial and heritage rich World Heritage-listed city of Galle, first settled by the Portuguese in the early 16th century. Relax for the next two nights at the newly restored hotel, located in the heart of the 400-year-old Galle Fort. Dine on mixed Western and Asian dishes at the sunken courtyard of Fortaleza Restaurant. Alternatively, try The Fort Printers Restaurant located in an 18th century mansion. Explore the local market before learning how to make a Sri Lankan curry. Alternatively, learn about the process of cinnamon harvesting. After a leisurely afternoon, explore the streets and history of Galle Fort with a local expert before enjoying dinner at Pedlar’s Inn, the former British post office, now a charming café, in the fort’s old quarter. On the way to Bentota, explore the mangrove eco system with a cruise along the Madu River including a visit to an island with a Buddhist monastery. After lunch at the country home of the renowned Sri Lankan architect Geoffrey Bawa, stop at the sea turtle hatchery operated by the Wild Life Protection Society of Sri Lanka. In Bentota, check into your luxurious hotel overlooking the stunning palm fringed coastline. Sri Lanka is known for its beautiful beaches so take time for a leisurely walk along the beach before heading to the capital, Colombo, visiting the Natural History Museum upon arrival. After enjoying lunch at the Ministry of Crab, one of Asia’s top rated restaurants, check in for your Special Stay hotel, lauded as the ‘finest hotel east of the Suez’. Relax with pre-dinner drinks overlooking the ocean. Afterwards, enjoy your farewell dinner at the 1864 Restaurant and Wine Cellar. Take a guided walk, exclusively designed by local expert Mark Forbes, through Colombo’s growing metropolis and witness the colonial old-world charm, such as at a visit to the Dutch Wolvendaal Church. After a late check out, transfer to Colombo airport for your onward flight. Please book flights to depart after 9pm.